Presidium supported by Chamber of Commerce, Industry, Crafts and Agriculture of Rome. "Is better to curdle the milk with lamb rennet but is possible also to curdle it with the flowers of the wild thistle or with the seeds of safflower or with fig's milk . However the best cheese is made with the minimum possible amount of medicaments. (Lucio Giunio Moderato Columella De Re Rustica, 50 d.C). In Roman times the use of wild Cardoons in the cheesemaking process was quite. We are trying to revive the tradition in the Roman Countryside where Cardoons Flourish. We agreed to experiment using the Flower of the Thistle specially cultivated for use as Rennet in the raw milk sheep cheese that recaptures the flavor of the ancient Cacio Fiore . SLOW FOOD with the Presidium seeks to sustain this project. Cacio Fiore is an ancestor of Pecorino realized with vegetable rennet. Thanks to enzymes of wild thistle (Cynara cardunculus), we are able to produce one of the highest quality sheep cheeses in the world. The yellow rind encloses a creamy heart of almost liquefied cheese. The taste is intense, unsalted and slightly bitter. To the eye the cheese is tile-shaped. The consistency is soft and creamy. The smell is pungent. 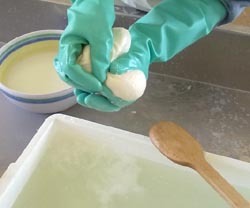 "How to make the cheese called 'Hand Pressed' is widely known. The curdled milk in the churn is separated from the serum when it is still warm. dousing it with boiling water, it is pressed by hand using boxwood. The taste is also pleasant when it Is hardened in pickled brine and then flavoured with Woodsmoke from burnt appletrees". (Lucio Giunio Moderato Columella De Re Rustica 50 d. C.). 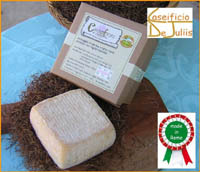 Pressato a Mano is a pressed by hand sheep's cheese and then filled with smoke with wood of apple-tree. The consistency is soft and lightly granulous. The smell is of fresh milk. The taste is medium salted. According to a text of Apicius, where he tells about some recipes in use during the Roman Empire, we know that more than two thousand years ago, most milk used for producing cheese came from sheeps and goats . Out of one of the recipes dating back those days came our curiosity for soft cheese washed in hot water and this is where we got the idea of making mozzarella cheese with the sheep milk. Salted fish and cheese cake. Patellam tyrotaricham ex quocumque salso volueris: coques ex oleo, ex ossabis. also the final operation,stretching and cutting the head, Is hand made The Mozzapecora is salted in brine for about 5 hours kg and then moved in cold water. 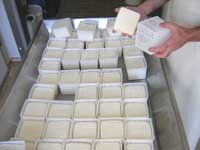 The paste is soft and compact with small holes and fresh and acidic ewe's milk adour and taste.